This Case History covers a system built in 1998 for a customer who had to remove cutting oils and chips from tubular components with irregular curves. Two cubic feet of parts were to be washed and rinsed in batch loads requiring rotation in baskets with lock-down lids (see below). In addition there were a number of other components that did not require rotation and were much more easily handled in standard baskets. The two stage process included wash and rinse stations. 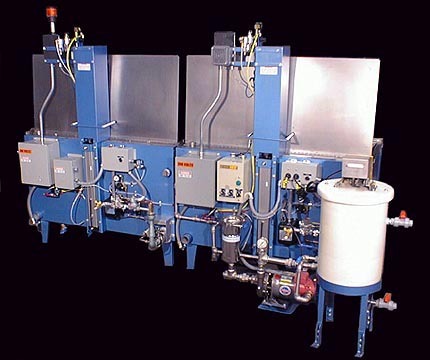 The system used two standard MK Series Immersion Washers. 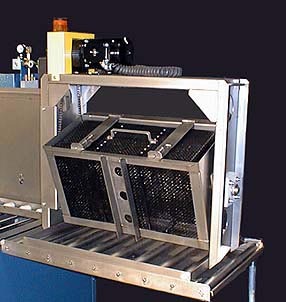 TurboFilter and SurfaceSweep Oil Removal were used in the wash station. Platform oscillation was employed in both stages. 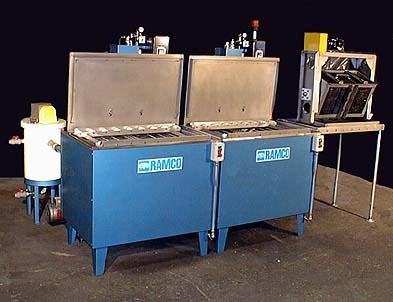 RAMCO has manufactured a number of flexible washing systems with the capability of processing standard baskets or lock-down baskets in rotating fixtures. The rotator (above) is an independent unit that sits on top of the elevator platform and is transferred from station to station over specially designed roller conveyor sections. The basket is carried into solution and continues to rotate and oscillate (in and out of solution). 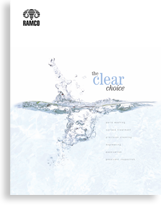 Using Ramco dynamic flow combinations (platform oscillation used in conjunction with turbulation and rotation) provides superior processing results. A similar system was bulit for the same account using a larger processing tank and a gas heating coil in place of electric immersion heaters. The back of the system is shown below. 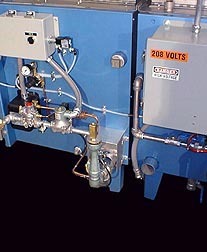 The gas heating system includes an atmospheric burner with electronic ignition.